The search of Black Gold has been striving dutifully to take away my blogging away from me but I can only be hibernated. Since the beginning of this month of October I have been on the run from the Oil city of Port Harcourt through the many villages of the Delta and ultimately the waffi town of Warri. But Arsenal has never been stolen away from me, neither have Nigeria and football been silent enough for me not to notice. Napoli offered Arsenal their first October challenge but the gunners swept them away within the first 15 minutes. It was the second match of the UEFA Champions League and Arsenal’s new boy and bride, Mesut Ozil opened his account for the North London Club. The ecstasy around the world by gooners could not be measured on the ecstasy scale. The goal looks so easy but he placed it so well that Reina could do nothing about it. Sagna, Giroud and Ramsey all had a hand in that goal. Arsenal were reaping the fruits of their 42 million pounds in the purchase of Ozil. But it wasn’t just the money boys that made the headline. Free-buy Flamini was the marshall in front of the defense. His partnership with returnee Mikel Arteta was water tight. They alongside the duo of Koscienly and Metersacker made a lot of tackles making Szczesny’s job easy. The spirit was high and the gunners matched on the hawthorns to face in-form Westbromich Albion. Steve Clark had done a good job in recent times and had stolen all three points from the Theatre of Dreams. Sagna had a hamstring problem and thus Jenkenson started from the right. I had expected to see Rosicky in the line up but the birthday boy had to do with the bench. The gunners huffed and puffed, missed chances but Wilshere was at the thick of almost everything especially losing the ball and holding it too much. The referee didn’t even pity him and Westbrom always capitalized on such scenario. Ramsey had a crack at goal but it was still goalless. Just before the break, WBA took the lead. Szczesny could do nothing as Yacob nodded in a cross from amalftino. This will be the first time that the gunners will not score first in a game this season. I was beginning to wonder how the media would crucify the gunners if the game ended thus. Ramsey had taken a knock and in came my best Arsenal Player, Tomas Rosicky. His introduction added a degree of fluidity and pace to the midfield and thus a goal was destined to come. 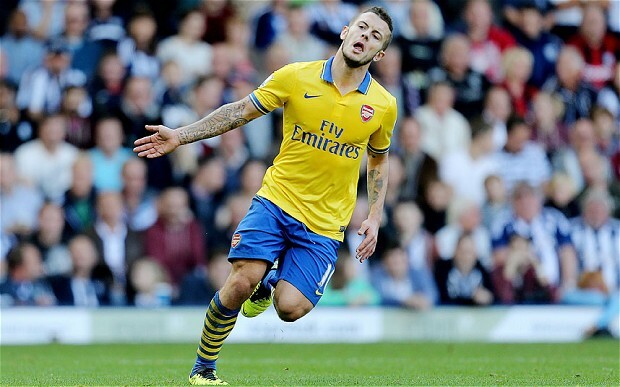 Wilshere had blasted to the stands from a Giroud pass but the momentum was on the yellow side. Finally the goal came, Girould held up play well, got the ball to Rosicky who teed off Jack Wilshere. The smoking gunner took a shot which took a lick of deflection and found its way to the net. The away fans went berserk and a new arsenal rhyme was formed: “Jack the lad” “He smokes when he wants”. The young lad had been criticized by Wenger on his smoking antics but he responded with that goal, his first since October 2010. To be fair, Wilshere was below par all through the game, but a goal can wipe every tear away. The game wore on with both sides having a chance at goal. The greatest of which was Giroud’s failure to put the ball behind the goalie after a wonderful pass from Wilshere. He was subbed for the World’s Best Striker. Niklas Bendtner came in for his first premier league game since ages. Two passes and a header was all the Great Dane could contribute in 6 minutes. The final whistle signalled the away winning run of the gunners but they would take solace that they have not lost since the Aston villa slap on match day one. The result looked better seeing Spurs stunned at White Hart Lane by Westham 3-0. The gunners returned to the summit albeit on goal difference till after the international break. The international break begins and my dear Nigeria would take on Ethiopia to determine who goes to Brazil in 2014. The likes of Emmanuel Emenike, Victor Moses, Mikel Obi, Ahmed Musa and Ogenyi Onazi are in the team and I see no reason why we shouldn’t teach the east Africans a lesson. A 3-0 win would be appreciated. I bet Emenike would continue his run for the Super Eagles. Apart from the internationals to come, there is a decider fixture in the Glo Nigerian Premier League between holders Kano Pillars and two times African champions Enyimba FC of Aba. This is a rescheduled week 31 match that was disrupted by pit invasion in Kano. The League management Company had earlier ruled the game inconclusive because of the invasion that ended the game with Kano Pillars leading 1-0 at 87 minutes. The LMC rescheduled the game for Lagos and banished kano Pillars to nearby Kaduna but the NFF swayed in. This indecision prompted the Nigerian Football Federation to go through the rule books and thus three points and three goals were awarded to Enyimba FC of Aba. Their camera man had been beaten black and blue and the camera damaged during the pitch invasion after Gambo Mohammed had scored a free kick. Kano Pillars were further banned from their stadium to Lokoja and asked to pay a huge fine. The Groundnut boys of Kano appealed and it is very surprising that the appeal committee ruled against the NFF. The appeal committee had ordered the game to be played today 8th of October. I am very disappointed with that decision because the rule of the game has been kept aside. Nevertheless, the game is billed to go on. This has been the bane of the Nigerian Premier league. I hope Enyimba FC grabs three points with three un-replied goals since Kano Pillars have a bad away record compared to the Aba Elephants. I see Lokoja as a neutral ground but let us wait and see. I get to hit the road now, still voyaging the delta in search of the black gold. Meanwhile the Nominations for the best Nigerian blog is on. Do good to nominate soccergunz.wordpress.com as the Best New Blog (section 14) and the Best Sports Blog (section 23) on Nigerian Blog Awards. Also Do nominate amoscp.wordpress.com as the Best Personal Blog (section 17), and Best Faith Based Blog (section 8) on the Nigerian Blog Awards. Next Next post: Was Jack Wilshere Asked About Adnan Januzaj?